Lisa Falzone is the Co-Founder & CEO of Revel Systems, an award-winning iPad point of sale solution for single and multi-location small businesses and enterprises. 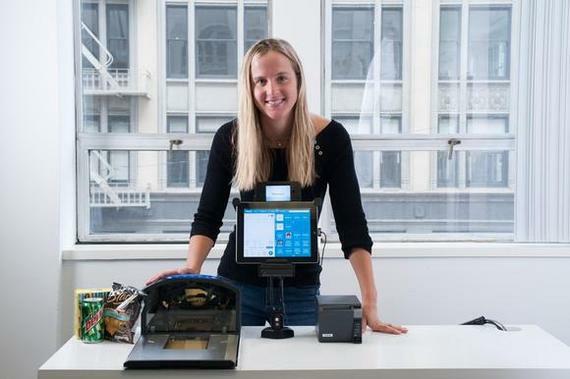 A graduate of Stanford University where she was a competitive swimmer, Lisa led her Silicon Valley-based startup since its creation in 2010 and has been pivotal in turning the often "old school" perception of point of sale on its head, beating out established competitors and new market entrants alike. She has raised over $115 million in funding for Revel, inked a strategic partnership with Intuit to deliver QuickBooks point of sale powered by Revel Systems, is working closely with Apple to bring exclusive iOS features to its point of sale customers, and has grown the company to more than 300 employees worldwide. Lisa's achievements as a young female entrepreneur have been recognized through numerous prestigious awards such as Forbes '30 Under 30′, Forbes 'Women To Watch: Eight Rising Stars', Business Insiders "30 Most Important Women Under 30 In Tech", San Francisco Business Times '40 Under 40′, and Business Journal's "Upstart 100". Lisa: To me, entrepreneurship means starting something out of nothing. Revel Systems, for example, emerged as an idea of an online ordering app. My co-founder and I were working on it, and realized what merchants really needed was a comprehensive iPad POS system - a complete platform that would go beyond simple payments and help businesses grow and succeed. Neither of us had started a business before, and this idea grew out of nothing - that's what it means to be an entrepreneur. A lot of people can be entrepreneurs - they don't necessarily have to start their own company to be entrepreneurial. It can take many forms - a person can be entrepreneurial in their job. Being an entrepreneur is about thinking differently - thinking creatively - and building something that didn't exist before. An entrepreneur must be resilient and creative. Q: What are you most proud of in your professional career? If you could do something over in your life, what would it be? Lisa: I'm most proud of building Revel Systems. I built it from the ground up, and now we're at 300+ employees, raised over $115 million dollars , and growing over 200% a year. I've made a lot of mistakes, but there's nothing I'd do differently. I learned from each and every mistake I've made - I wouldn't do it differently because then I wouldn't have that opportunity to learn. Making mistakes is essential to growth - it's how you deal with, and overcome, those mistakes that determines success. Q: Tell us about an instance where you had to go against the flow to realize your goal. Lisa: That's everyday! Everyone tells you 'it can't be done, it's impossible' - people tell you that what you're doing or building can't be done. Even people you've hired or partnered with will naysay or discourage you. Regardless of this, you have to make things happen. You have to listen to your own entrepreneurial drive, and trust in your ability to get it done. Q: What distinguishes Revel Systems in the mobile payments space? Lisa: One thing that really distinguishes Revel from its competitors is that Revel is truly an iPad POS platform. People often confuse POS with mobile payments, but Revel is so much more than that. We offer businesses the centralized management platform from which they can run their entire business - from CRM and loyalty programs, to intelligent reporting and employee management, Revel is the platform from which you can run and monitor your entire business. We offer a complete solution for business owners, allowing them to streamline operations and increase their bottom line - and in that way go above and beyond the mobile payments space. Q: LinkedIn style - If you were to give advice to your 22 old self, what would it be? Lisa: When I was 22, I had no idea what I wanted to do. I was really stressed out about it, and felt bad about myself. All my friends had amazing jobs after graduation, and I didn't. Now I would tell my 22-year-old self to enjoy that post-college time of uncertainty. Rather than stressing, I should have enjoyed that freedom, and the world of opportunities to doing something new. We all find our path, and a little uncertainty is necessary to get there. Follow Lisa Falzone at @LisaFalzone, and check out the other interviews in Going Against the Flow series at http://www.huffingtonpost.com/charu-sharma/.